Televisionista: "Desperate Housewives" Spoilers #414 "Opening Doors"
"Desperate Housewives" Spoilers #414 "Opening Doors"
I've already posted several images from the "Opening Doors" episode of ABC's "Desperate Housewives" (airs Sunday, May 4 at 9/8c) featuring the return of Wisteria Lane's gay couple. Now, here are the rest of the images from the episode along with some scoop. 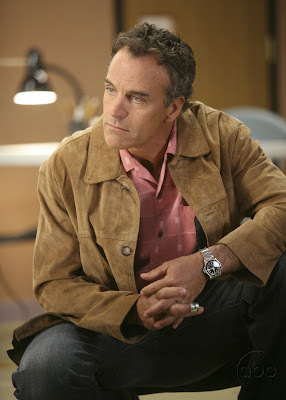 According to an official ABC press release, Lynette finds out who was responsible for starting the fire at Rick's restaurant, Bree gives Orson an ultimatum and Susan reconnects with her ex-husband, Karl (guest star Richard Burgi, pictured above with Teri Hatcher). 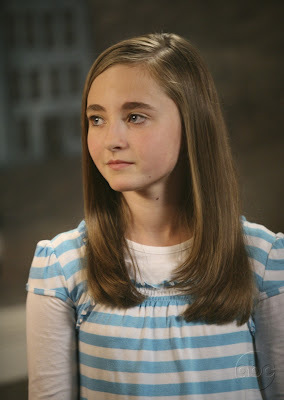 Little Kayla (Rachel Fox) will be revealed as the mastermind behind the fire at Rick's restaurant. Lynette takes her to see a psychiatrist, after it is revealed she manipulated her brothers into setting the fire (I can't imagine those little devils being entirely innocent, though). Obviously, the boys were scared by the sight of their parents fighting (in last Sunday's episode). But since the obvious first suspect was her father Tom, the only member of the Scavo family she appeared to actually care about, what was Kayla trying to accomplish? 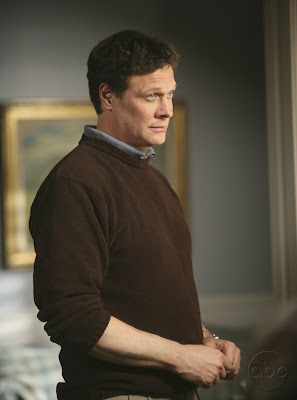 Susan will bump into Karl at a Lamaze class, where hex ex-husband comes with his pregnant girlfriend. Susan is embarrassed because of her old clothes and Mike not being by her side (he is being recognized for staying off drugs for 30 days). She makes sure Mike accompanies her to the next class dressed to the nines. As I mentioned in the earlier post, Justine Bateman ("Family Ties") will guest star in the episode as part of Gabrielle's storyline. Gary Cole returns as Katherine Mayfair's ex-husband.